Saddle up and ride over, up and around Kamchatka’s highest and most active volcanoes. Support by 4 or 6WD truck. The route of this tour passes through the most active volcanic zone of the peninsula and along a high-mountain (1000 meters above sea level) plateau, surrounded by 9 of the highest volcanoes of Kamchatka. Passing outstanding volcanic scenery, some formed only 20 years ago, you will have an opportunity to walk throughout the Ash-cinder plain resulting from the Northern vent eruption. 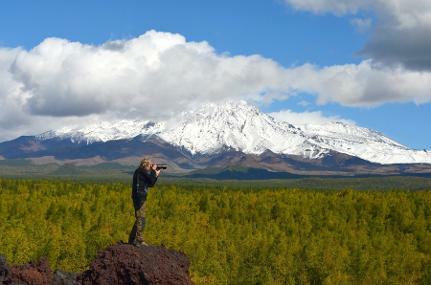 While tour you will be able to hear the heartbeat of the Earth of Mutnovsky, Gorely and Avachinsky active volcanoes. You will always remember the beauty of the largest active volcano of Eurasia - Kluchevskoy (4850 meters) and also you can see Tolbachik Volcano. The route will be mainly throughout the tundra, where there are plenty of marmots, ground squirrels, foxes, and bird life, and there should be multiple possibilities to see bears. Day 1. 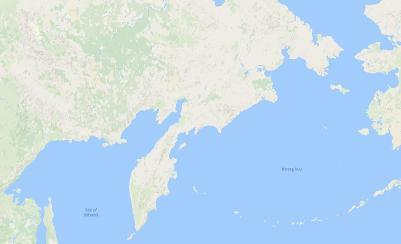 Arriving in Petropavlovsk-Kamchatsky. Transfer by bus from the airport to Petropavlovsk Hotel. Preparing for the trip. Welcome dinner in a city restaurant. Day 2. Guided city tour and a visit to the Ethnographic museum, central market, walk along the shore of the Avacha Bay, second biggest natural harbor in the World. The museum's displays are devoted to the history of the region, its flora and fauna, the native peoples of Kamchatka and their ancient culture. You will learn about the ancient tribes that lived in Kamchatka thousands of years ago, about the discovery of this beautiful land by Russian explorers, the heroic history of Petropavlovsk-Kamchatsky. There are interesting exhibits on Kamchatka's nature: the Kronotsky Nature Reserve, Kamchatka's volcanoes, its wildlife and natural resources. You will see an exhibition of handicrafts by local artists. Stay in the same hotel. Day 3. Early morning travel by 4 or 6WD bus to Milkovo settlement (approximate. 300km from your hotel), visiting the local museum and old Cossack architecture. Drive north and camp near the Kamchatka River or stay in cabins in Kozyrevsk settlement. You will have a chance to try the Banya (Russian sauna). Day 4. Continue further north to a camp on the slopes of Tolbachik volcano (60 km over forest road). Tent camp. Day 5. 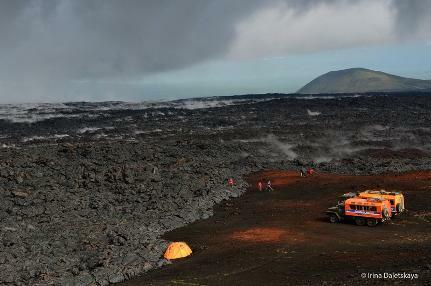 Visit the new craters of Tolbachik (eruptions of 1975 and 2013 years), hardened lava flows formed in 2013, the dead forest and other volcanic sites. Camp. Day 6. Ascend Plosky Tolbachik (3085m). At the top you will be amazed with panorama of Tolbachik Dale and also 50 slag cones, where the famous Holocene eruptions of Tolbachik took place. Day 7. Reserve day in case of bad weather. Alternative visiting Alaid and Pinzer craters. Overnight in tents. Day 8. Drive to the settlement of Esso, home to the Evens, one of the 4 indigenous peoples of Kamchatka. Visit the local museum to learn something of their culture. Welcome dinner with Even folk concert. Accommodation in private hotel. Day 9. Return by 4 or 6WD bus back to south and stay in tent camp near Malky thermal hot springs, bathe in hot natural water. Day 10. Drive to Mutnovsky Volcano plateau (180 km). Rest near Viluchinsky waterfall. Further drive to Mutnovsky volcano plateau (1 hour). Evening excursion on a plateau of alive with volcanic activity. Overnight in tents. Day 11. Ascend active Mutnovsky Volcano (2323m) - day trip. Mutnovsky Volcano's nest of merged craters is perhaps the most beautiful volcanic phenomenon in Kamchatka. The view from its summit is magnificent: steep walls surround the vast and deep crater lake, (previously a glacier until a violent eruption in 1999) framed by hissing mofettes vents, jets of superheated water and rocketing plumes of sulphur smoke. Everywhere there is the deafening roar of volcanic madness, and exhilarating rumbles underfoot. Return to the camp. Day 12. Day trip to ascend Gorely Volcano (1829m). A chain of 11 craters across it's peak make for a unique sight. Stay in the same base camp. Day 13. Drive by 4 or 6WD truck to Verkhne-Paratunskie thermal springs area and stay in tents on Paratunka River bank. Bathe in Verkhne-Paratunskie thermal springs. Day 14. Drive by 6WD bus along the Sukhaya River (Dry River) to the Avacha Volcano plateau (80km). Making a base camp between Avachinsky and Koryaksky Volcanoes (860m) or stay in cabins there. Day 15. Ascend Avacha volcano (2751m). The trail ascends by a gradual slope to the top (time needed 5-6 hours for the ascent). You can have lunch on the edge of the crater of the volcano (filled to the brim with hardened black lava after an eruption in 1991) of the volcano while enjoying the magnificent panorama of the Pacific Ocean, Petropavlovsk, Zhupanovsky and Koryaksky Volcanoes, and Nalycheva Valley. Day 16. Reserve day in case of bad weather. Travel to Paratunka resort (1.5 hours). Accommodation in a guest house. Bathe in an alfresco pool with thermal hot water. Rest. Visit a local farmer Sasha Yastrebov, for a folk concert in a Yurt. A party sampling various seafood dishes and drinking Russian vodka and homemade balsam.